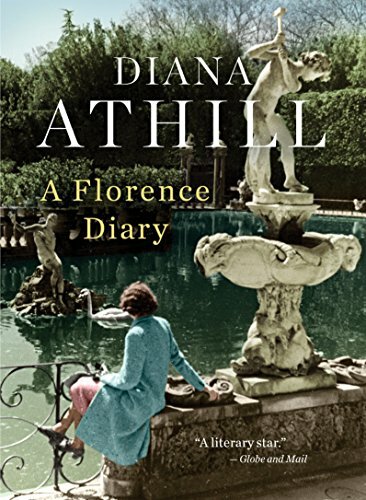 Diana Athill is a publisher and noted memoirist but she's apparently only written one diary in her life, that chronicling her two week train trip to Italy and specifically to Florence, a trip she took just after WWII with her cousin Pen. In a time when two young single women (Athill was 30) didn't go on foreign adventures alone, Athill and Pen were unusual and lucky when they were gifted with a trip to Florence by Athill's aunt. Opening with an introduction from Athill musing on her many fabulous foreign holidays, the experiences she's had traveling, and why she so loves the possibility of a trip, the introduction is a delightful piece of reading and the perfect opener for the rather brief diary. Athill is a quite observant of the places and the people they encounter and she has recorded some rather pithy observations. For instance, mentioning fellow train passengers, one of whom only spoke English and one of whom only spoke French, she remarks that their baby "not unnaturally, was turning out a late speaker." The recounting of the trip and especially the gallant and gentlemanly men they met on it is lively and entertaining to read. The picture that Athill draws of Florence and the trip is over all charming although she does record minor irritants in the pages as well. But her chatty and engaging narration makes the reader wish to have been along on that long ago trip too. This is a beautifully written small gem of a book, almost briefer than Athill and Pen's two week holiday. Armchair travelers who enjoy light reads will thoroughly enjoy this for the hour or two it takes to read and enjoy. Thanks to the publisher for giving me a copy of the book to read and review.